Internationally acclaimed Alabama artist, the late Frank Fleming, created an amazing body of work over the past forty years. He worked in both porcelain and bronze to create sculptures which are inspired by nature and yet retain a mystical, dream-like quality. Fleming grew up on a farm in Bear Creek, Alabama with a disability that involved his speech. The natural world of animals and plants filled his consciousness during his first eight years of childhood when he chose not to speak. An artistic genius was forged in his silent youth that is highly individualized and authentically Southern. The sculptures he created for Riverwild Garden are inspired by the riverine animals that are part of our great Tennessee River and his beloved Bear Creek. Internationally known Alabama artist, Bruce Larsen, finds inspiration in fragments from the past whether they be parts of old farm equipment, pieces of weathered driftwood, or animal bones he unearths. Archeology and paleontology are intimately wedded in Larsen’s fantastical vision. 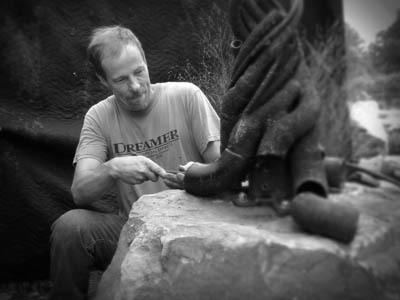 Referencing natural processes and native creatures from his home in Fairhope, Alabama, Larsen transports his audience with fifteen foot dragonflies, butterflies made from recycled bicycle wheels, and great blue herons fashioned from a puzzle of reclaimed scrap metal.He created the Heron Great Tree Gateway and the Dragonfly sculptures in Delano Park. A graduate in illustration from Auburn University, Larsen began his career as a sculptor by combining his art skills with his genius in working with animation and special effects for the film industry. He is well-known for creating animatronic horses for movies including The Patriot, Dreamer, and Planet of the Apes. His large scale outdoor sculptures are in public collections such as the Mobile Museum of Art and the American Sport Art Museum. In addition, his work is in the personal collections of the Crown Prince of Bahrain, Shaikh Al Khalifin, Robert Kennedy, Jr., the Shaolin Temple in China, and Philippe Cousteau. Tennessee landscape architect, Ben Page, developed his love for the land and natural processes while working in the gardens of his great-grandmother and grandmother in southern Kentucky. His extraordinary genius and uniquely southern vision were honed at the University of Georgia and through his work designing some of the most amazing landscapes in the country. Always sensitive to the historical significance of a place as well as classical principles of design, Page creates gardens and public spaces that tell a story and “wow” his audience with cool horticulture and gorgeous hardscape. Ben Page’s award winning work has been published nationally and featured on HGTV. 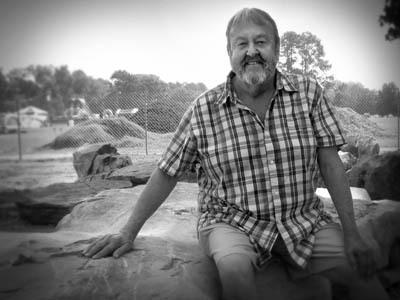 Ben designed the Riverwild Children’s Garden and has utilized his gift for historic restoration in the Historic Rose Garden for over 10 years. His other projects include the Vice President’s Residence, Washington, D.C., Cheekwood’s Boxwood Gardens, Howe Garden, and Literary Garden, Dixon Gallery and Gardens, and Memphis University School.